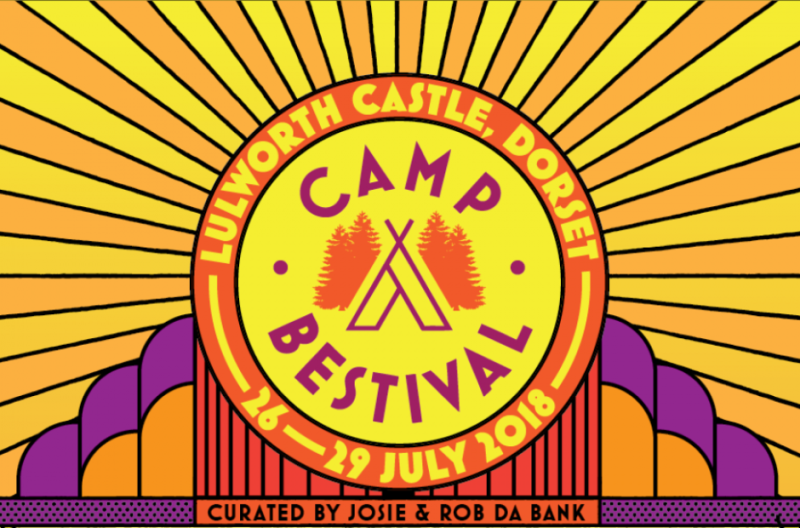 Last year, Camp Bestival was one of the highlights of our Summer and I knew that we would end up going again this year. 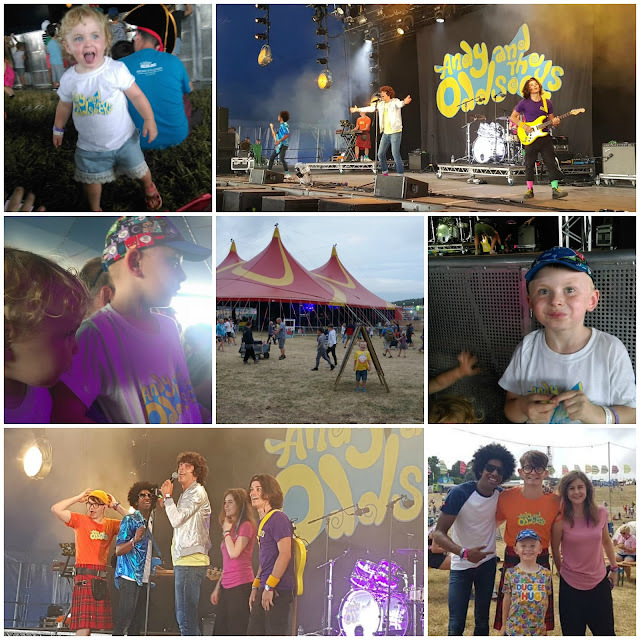 As luck would have it, we were only able to go on the Friday (which is the first proper day) and this coincided with the Andy & The Odd Sock show AND the nice weather! Unlike last year when I packed wellies, raincoats and black binliners, this time round it was sunglasses, sun lotion and plenty of water! We decided to leave nice and early again incase of festival traffic but we needn't have worried, we arrived on site around 830am and got parked straight away. The carpark was massive and we had a good 10/15 minute walk to the entrance but I'm just glad the ground was dry with no chance of my buggy slipping out of my grasp down the hill like last year! Our first stop was the Dorset Farmers Market for breakfast because surprise surprise, the kids were hungry already! Randomly, on Elliot's summer holiday bucket list he wanted to have a croissant so he managed to tick this one off, it was a chocolate one too. I've no idea where his need for a croissant came from, we have had them before! After brekkie we headed up to the Magic Meadow to get our bearings and start exploring. I have to say, it was so nice to be able to wander round freely and not be dragging the buggy through thick mud like last year! 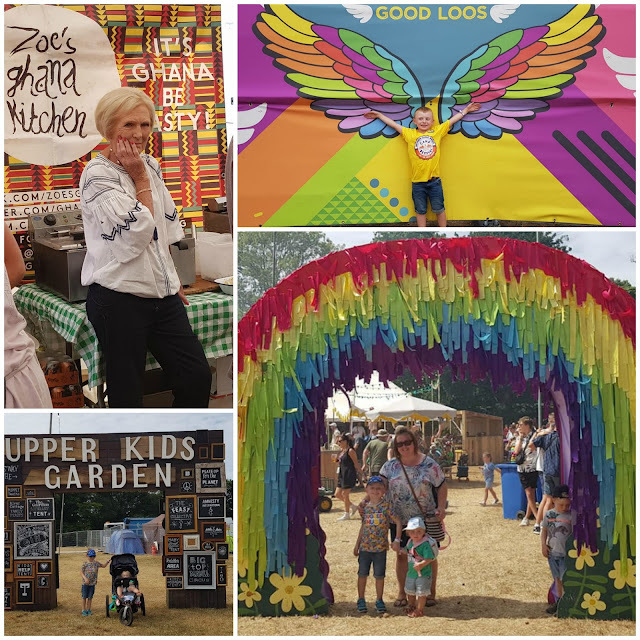 We didn't really have a strict itinerary - I know some people do at festivals, and you could go through the timings with a fine tooth comb and plan your whole day around who you wanted to see but ours was very much a laid back plan. The Magic Meadow has a whole host of things to see such as the Bollywood tent, Caravanserai, The Wall of Death, climbing walls, the Love-Bot robot, the Big Top, trapeze and circus school, HMS Bestival (a life sized ship filled with entertainment), an inflatable church, a giant disco ball and the World's Biggest Bouncy Castle. And trust me, it's massive! Elliot missed out on this last year as the queues were too long so we decided to do this first - and luckily because it was still quite early in the day, he was straight on. He loved it! We spent the next hour or so wandering through the Castle Field where we discovered the charity area tucked away in a quiet spot. Lots of great charities with stalls and most of them had something for the children to either win or do which is always a bonus! Elliot managed to win himself a big cup of fruit which was swiftly claimed by Erin! 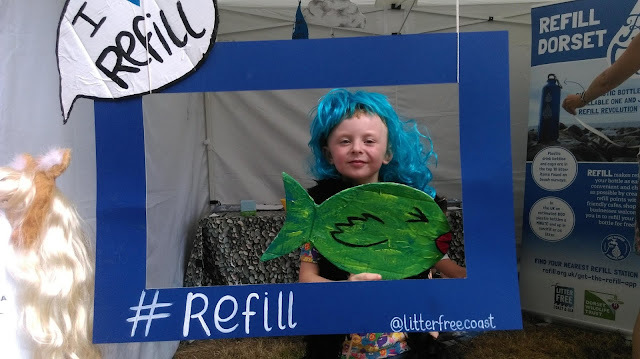 The kids spent ages at the Litter Free Coast stall where they got busy making medals and trying on different accessories for a photo. Elliot looked quite fetching in a blue wig!! Next up was the area Elliot was most excited for - the lower kids garden. Here you will find the Science tent which plays host to lots of live experiments on stage, the CBeebies tent, facepaint, softplay, funfair rides, Insect Circus and Museum, LOL surprise fun, Family Traveller, lots of tempting food and drink vendors and Make Space - which is every arts&crafters dream! There is literally so much to see here that you could spent your entire day in the Lower Kids Garden and not be bored. Number one on our list was a Duggee hug in the CBeebies tent. My children are obsessed with Hey Duggee and I've heard the Stick song more times than I care to mention! We queued up and as predicted, Erin freaked out at the sight of Duggee. She's not really a fan of a)things bigger than her and b)people in costumes! Elliot got his Duggee hug though and they both had a bounce to the stick song that Elliot sung....those poor people working in the tent, wonder how many times they heard "Stick!" over the weekend?!! We could have spent longer in the Lower kids garden but our tummies were rumbling so we headed up to the Upper Kids Garden which is where the Feast Collective is located. The Feast Collective is a celebration of exceptional, artisan food producers from across the UK and there is something to tempt every taste! It does get very busy in the tent and I really struggled to get the buggy round due to the crowds, and it was SO hot. Paul got himself some kind of fish dish but I couldn't decide, too much choice! Me and Elliot decided just to get an ice cream - the heat does funny things to your appetite doesn't it. We also spotted Mary Berry at Zoe's Ghana Kitchen and she was filming - I have to say she looked a lot less sweaty and hot than us! 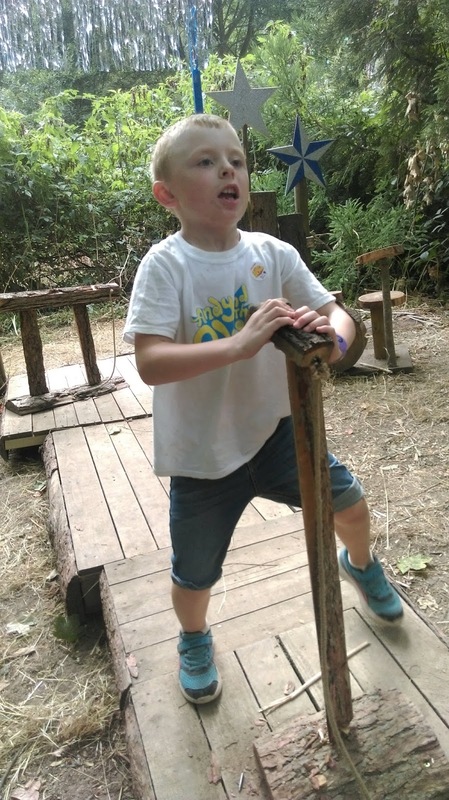 After a quick play in the circus area and a promise to come back later we headed for Dingly Dell. 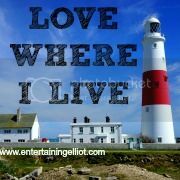 This is an area that I have heard so much about from fellow bloggers but we totally missed it last year! 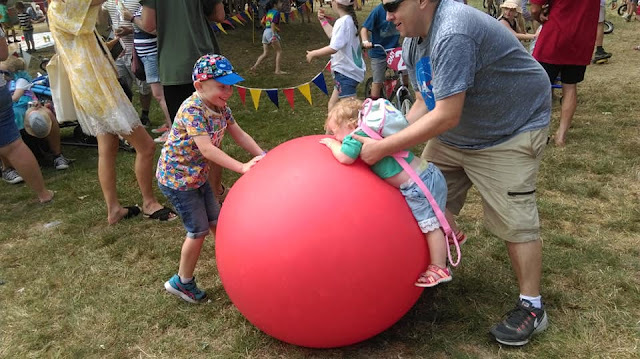 It feels a world away from the hustle and bustle of the festival but there were so many things for children to do - plus being a woodland, it was very shady which was VERY needed on a hot day like it was. 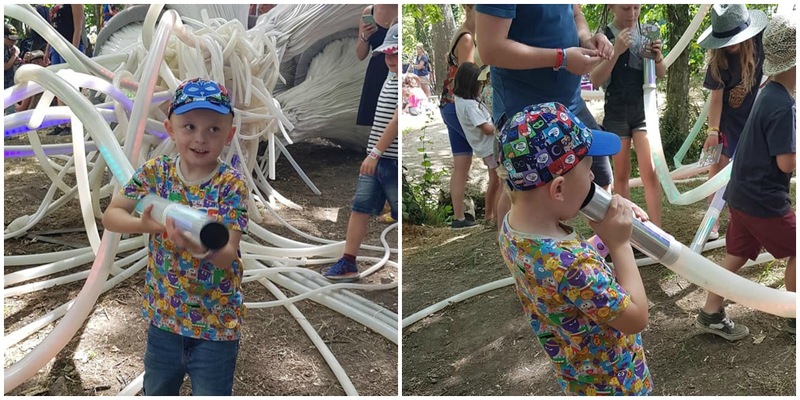 Elliot was immediately drawn to the Kew Gardens area where he found a totally amazing interactive installation of a giant fungi. It was fascinating! It was musical, it lit up - I can only imagine that it looked even more impressive at night time. Heading deeper in Dingly Dell we found Lizzie's Way which Camp Bestival describes as a woodland wonderland. Here we found a mud cafe, potions, woodland snaps, puppet show - so many things to fuel little imaginations. There was even a wooden band area so of course Elliot had to pretend he was in the Odd Socks! We could have spent longer in Dingly Dell but we had to get to the Big Top for the highlight of the day - Andy and the Odd Socks! 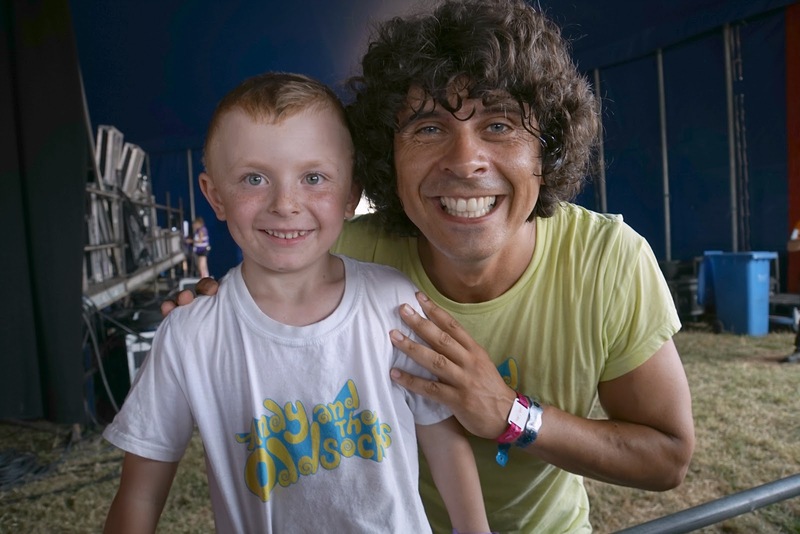 The Big Top was even bigger this year - and probably just as well because Andy drew a massive crowd. We were right down the front (as usual!) and it was a bit mad down there - I took barely any photos as I was holding Erin up on the barrier! It was a great show and the atmosphere was brilliant in the Big Top. We love the Dinosaur Football Legend Megamatch song and it's always entertaining watching the giant footballs bouncing around the crowd, not to mention the T-Rex on stage! 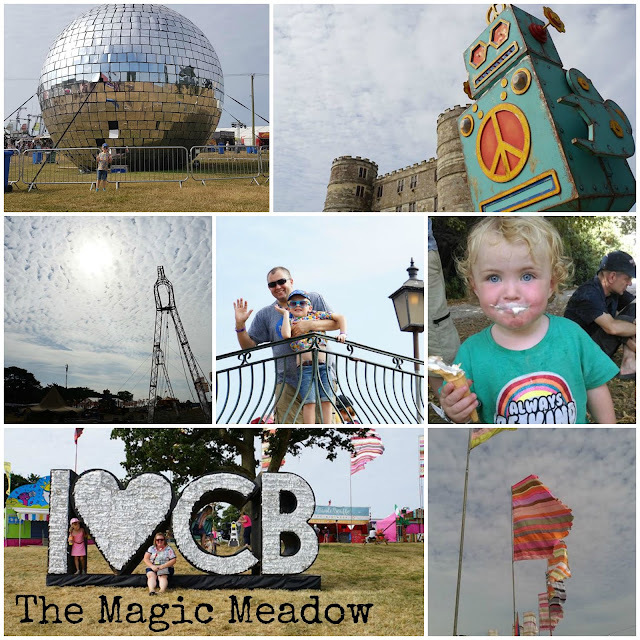 After stopping at Shaken Udder for a delicious milkshake, we headed for HMS Bestival. Erin had a nap while I sat and enjoyed the entertainment on stage. The boys decided to try out the games in the Actual Reality Arcade. Think of your favourite childhood arcade games....but life sized! They were in their element and spent a good half an hour battling laser beams and space invaders. 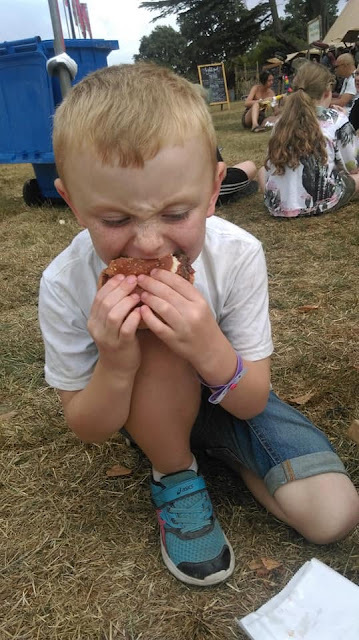 After a quick mini rave in the Bollywood tent we decided to head back to the Upper Kids Garden to grab something to eat and it was nearly impossible to decide again! Everything smelt and looked so good but in the end I decided on a tandoori chicken wrap with chips, whilst Paul and Elliot got burgers. Obviously the food and drink prices are a bit higher than average but you do kind of expect that when you go to a festival. Most stalls were offering child portions though which was good to see. It was lovely to have a sit down and watch the world go by for a bit. We actually bumped into some friends so it was nice to sit and have a chat whilst Elliot and his friend Willow showed off their flossing skills! 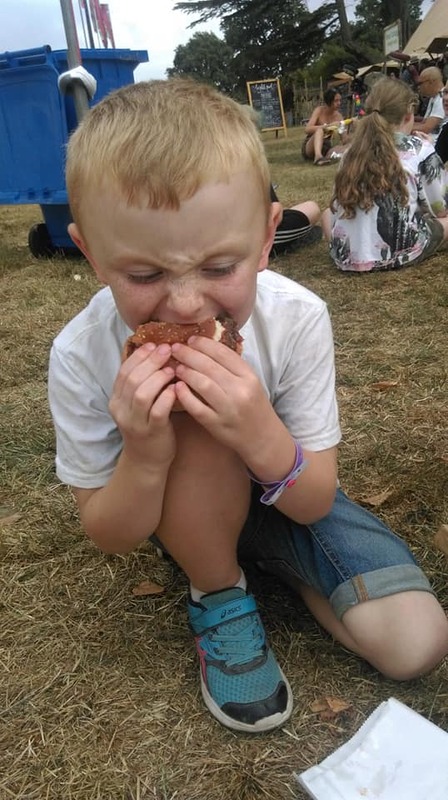 One of Elliot's favourite bits of last year's Camp Bestival was the circus area so we made a beeline for this after our food. Elliot literally could have spent all day there! He had so much fun walking the tightrope, attempting to ride a unicycle, balancing and bouncing on the giant balls. After deciding not to run away with the circus, we headed for the Greatest Tent on Earth in the Lower Kid Garden where we caught the tale end of the ZSL Gruesome Nature Live show. Elliot got a bit upset when he realised he'd missed most of it so we hope we get another chance to see this at some point! The crowds had thinned quite a lot by this point so we were able to take a look at the stalls - Erin was fascinated by the bubbles by Elliot predictably wanted to look at the toy stall! The staff were really helpful and helped him pick out a diabalo which was the right size for his height. He was a bit of a natural with it and had it spinning like he was a pro! 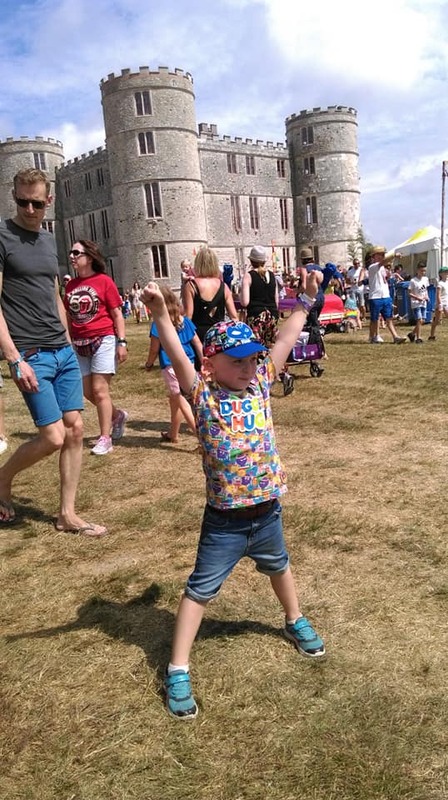 Our time at Camp Bestival was almost over for another year but on the way back to the carpark we stumbled across one of the parades. This is the first time we have caught one of these and what a treat it was. There was a nautical theme and the parade included a giant mermaid, pirate drummers, jellyfish, lobsters - even a shark! 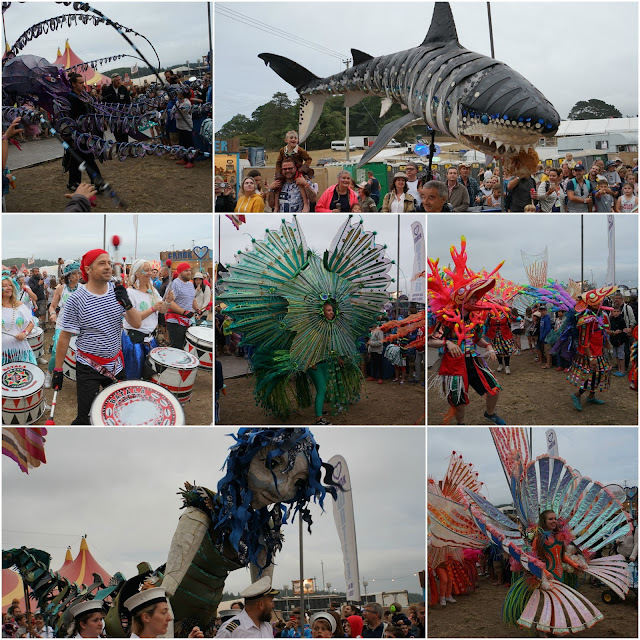 It really was a treat for the eyes and a fantastic way to round off our day at Camp Bestival.